How many times have you come up with an idea that you thought was good, prepared a document or presentation on it, presented it to an audience of your peers or managers, and then watched with abject misery as people heaped scorn or worse on it, treating it like it was worse than the bubonic plague? I have experienced this bliss first-hand as well as been an unwitting witness to such acts of human depredation. The ferocity of verbal assault on an idea can sometimes leave you dazed, wondering whatever could have aroused such primal emotions from an otherwise staid group of professionals. This is a brief, to-the-point book. The last section, a compendium on 24 responses, is handy. How can you not like a book where the cast of characters is given such evocative names as Pompous Meani, Avoidus Riski, Allis Welli, Divertus Attenti, Heidi Agenda, Spaci Cadetus, Lookus Smarti, and Bendi Wendi? The book describes attacks on ideas and proposals that people encounter everyday in their professional lives, and strategies on counteracting them. Taking a specific example set in a small town and a proposal concerning the upgradation of the town library's computer system, the authors describe attacks on the proposal. Each type of attack is described along with suggested responses. The writing is easy and jargon-free. 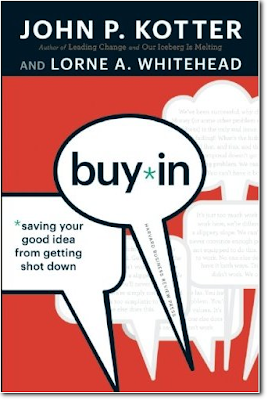 The focus is strictly on building buy-in, not on how to formulate ideas, or how to present them. 1. "We don't need your idea, because the 'problem' it 'solves' doesn't exist." 2. "Okay, a problem exists, but your solution isn't a good one." 3. "Okay, a problem exists and your solution is a good one, but it will never work here!" The book ends with a short but impassioned appeal to all to help stop this loss of good ideas to needless attacks. The numbers add up. The consequences add up. And that, obviously, is not good, nor necessary. Let's stop this needless loss." 1. Fear Mongering. "...aimed at raising anxieties so that a thoughtful examination of a proposal is very difficult if not impossible. .. Words can often play an important role in these cases. ... Memories of suffering can evoke fear." 2. Delay. "Death by delay can be a very powerful strategy because it's so easy to deploy. "We see confusion strategies used all the time, sometimes by people who don't like a good idea, but also by a Lookus, who, perhaps unconsciously, has a need to appear to be the smartest person in the room, or by a Spaci, who just doesn't think clearly." The proposers may be made to look silly. Questions may be raised about competence. Slyly or directly, questions can be raised about character. "Questions and concerns based on a strategy of ridicule and character assassination can be served with a dramatic flourish of indignation, but more often are presented with a light hand. There is a sense that the attacker feels awkward even bringing up a subject, but he nevertheless feels it is his duty to ask whether George's dinners with his admin assistant might ... No, no, that wasn't fair. Forget I said that." "Franco, how long have you been with us now? Six months? Oh - two years, you say! is it really that long now?" Inviting criticism, listening to critics, treating them with respect, preparing for criticisms, etc... are good. However, the authors point out that "this method, though powerful, is not guaranteed to work well in cases with a particularly aggressive, nasty opposition. But those situations with those sorts of people are, for the most of us, rare."